"On this May Day, let us stand upright and be counted!" 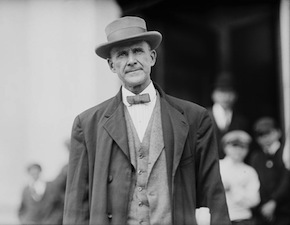 On the occassion of May Day, the powerful message of Eugene V. Debs still speaks to us as a voice of revolutionary socialism and a beacon of sanity in a world that is as insane now as it was then, and even closer to self-destruction. May it be an inspiration to all our movements! the organization of the railroad employees. thousand times I would rather spend my remaining days under lock and key than to betray or retard this great cause. and the doctors and the lawyers and the judges. They said, “He is preaching dangerous doctrines. hung has been the emblem for which tens of thousands have gone gladly to their death. their ashes have been scattered to the four winds. their names today are revered. which had existed in this country for 250 years. and their very memories reviled. shortly after, and the prison doors were opened. Atlanta, will the Moundsville prison stand forever? poured scorn upon that Supreme Court’s decision. great a cost! How terrible the price we paid! destroys what was left of democracy in this land. veins and the light of honesty in their eyes. war? The ruling class. You have never made war. or labor will be punished for treason. Who is it that is making the terms of peace? were captivated for a while by the exquisite rhetoric which he exudes; but beneath this shining fabric of words they found no substance of truth. word hearkens when he speaks. strength for the establishment of Soviet republics. preparing to follow their example. get together. We need to feel the common touch. them for tools, you work for their benefit. brother and see the new light that is shining there. us establish the service qualification for industry. whose labor has produced them. our bodies, but they cannot imprison our souls. long now before it shall triumph. Our emancipation, the emancipation from the power of the ruling class, cannot long now be delayed. and the right will win.